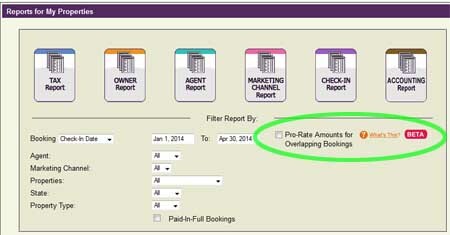 Bookerville's array of ready-to-run reports now has the option of "prorating" amounts for bookings which overlap the reporting period. Some municipalities require reporting in this fashion. If a booking starts on January 31st, and ends on February 7th, then if you're running a report for the month of January, the amounts for that booking will be calculated to 1/7th their value, because only one day (night's stay) was included in the month of January. Likewise, that same booking's amounts will be calculated to 6/7ths their value when you run the report for February. Don't forget that you can still choose to report based on Check-In date, Check-Out date, whether any of the booking dates overlap the reporting period, or whether any payments were made during the reporting period. The new prorating is optional, for those who need it.